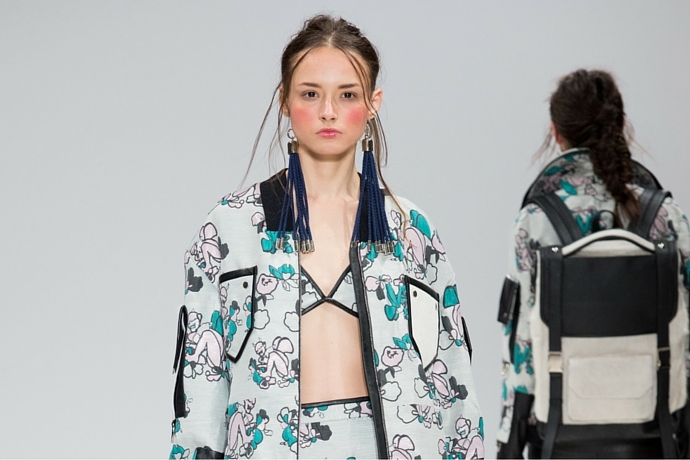 This season, London-based designer Jamie Wei Huang took a bolder approach. Her spring/summer 2016 collection titled Nibbana took inspiration from Buddhism and reflected her own interpretations of various cultures, religions and thought. And, while the designs are loud and clear, a careful look inside provides a deeper story and thoughtful construction. Without a doubt, leathers, jacquards and metal hardware are key themes, with one or more of these elements finding its ways onto each and every look. One story veered towards a modern day punk-like feel with harness straps, wide leg pants and large devils front and center on tops in red and cobalt blue that symbolized the nine circles of hell. Here, she combined hardware and geometric shapes with lightweight woven fabrics to balance the rage with femininity. She also worked with Jacquard prints that featured flowers with the same devilish character, now just smaller, but still softened the mood on bralettes and worked best on both of her jackets that may have been the strongest looks. Thankfully, Jamie designs shoes too; her chunky creepers and sandals tied it all together.